On October 27, 2018, 11 people were killed and six injured at the Tree of Life synagogue in Pittsburgh Pennsylvania. This act of violence against the Jewish community brings to our attention the dangerous extremes that fear and intolerance can lead to. JRS/USA strongly condemns such actions as we strive to build a more inclusive world which welcomes those of different religious, racial, social, and political backgrounds. 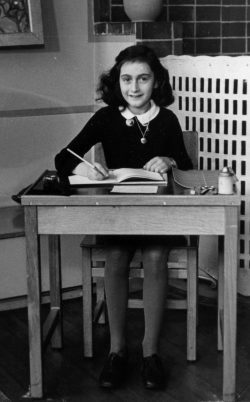 In remembrance of the lives lost, JRS/USA is proud to announce its second annual Anne Frank Essay and Video Competition in collaboration with the Embassy of the Kingdom of the Netherlands, the Jesuit Schools Network, Educate Magis, and America Media. We hope this competition will help raise awareness and conversation around the need to build inclusive communities and how Jesuit educated students can lead the effort. In 2017, Jesuit Refugee Service/USA (JRS/USA) received the Anne Frank Award, given by the Embassy of the Kingdom of the Netherlands to an American person or organization who has demonstrated a body of work which confronts intolerance, anti-Semitism, racism or discrimination, while upholding freedom and equal rights. Operating in over 50 countries around the world, JRS works to improve the lives of refugees and others affected by war and conflict through our education, livelihoods, reconciliation and advocacy programs. As a proud recipient of the Anne Frank Award, we strive to defend and protect refugees as they seek to heal, learn, and determine their own future. Students enrolled in any member of the Jesuit Schools Network (Grades 9-12) and/or Educate Magis are encouraged to submit an essay or video answering the question posed below. The top essay and video chosen will be posted online by America: The Jesuit Review of Faith & Culture. As the flagship magazine of America Media, America is the leading Catholic journal of opinion in the United States.